Fast Friday #9 is by... Lucky! We're lucky to have Lucky writing all this surprising stuff. Thanks, Lucky. Missed last week? Nooo! Unmiss it now: Octane And The Turbocharged Engine. Water injection has been around for quite some time going as far back as the early 1900's, but its effective use for the control of pre-ignition wasn't really discovered until WWII*. The earliest of gasoline engines had compression ratios so low that knock/ping was something that was nearly unknown and water injection was done as a means of internally cooling the engine instead of using water jackets around the cylinder as today's engines use. It's largely believed that German Aero engineers were the first to use methanol in the mix as a means of preventing the water from freezing. Renault's F1 racing team was the first credited with using water/methanol injection in 1983. Humidified combustion air lowers the peak combustion temperature by hundreds of degrees. 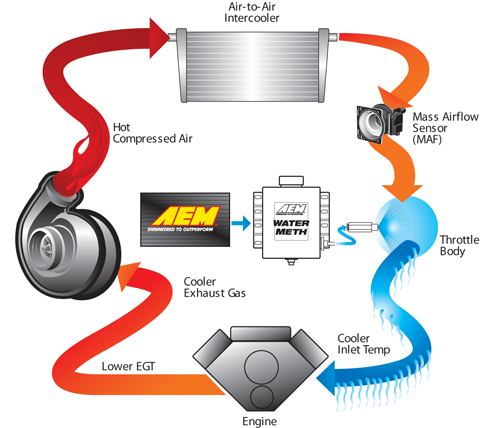 This is important as this cooling affects not only the incoming air charge but also any residual pockets of exhaust gas from the previous combustion cycle that can be a trigger for pre-ignition. Adding water/methanol injection to an engine in the proper amount is akin to running higher octane fuel, the increase in ignition timing is so significant that it's similar to running high octane racing fuel (100+). If you've talked with me at all about tuning you've heard me say "I'll take 2 degrees of timing over 2 psi of boost any day!" and it's 100% true. Ignition timing is king when it comes to both efficiency and performance. Timing that is too retarded 'chases' the piston down the cylinder rather than pushes it down. Timing that is too advanced causes the air/fuel charge to combust too soon creating peak cylinder pressures before 12 degrees after top dead center and can result in detonation or pre-ignition, both of which are bad for power and the engine longevity. We want the maximum timing we can get without having the mixture combust too soon, and water injection allows us to increase the timing and reduce heat. This double whammy affect is what makes it so desirable. Advancing ignition timing increases heat in an engine, this added heat promotes pre-ignition which is our nemesis. Water injection allows for more advanced timing while helping to offset that added heat that the increase in timing naturally incurs. There's lots of water/methanol injection kits on the market so rather than look at each one I'll say this: make sure the kit you choose is progressive. Static on/off type water/methanol kits provide too much water/methanol too soon and not enough at higher RPM. You want the amount of injected water/methanol to be proportional to fuel injected. Kits that provide proportional injection will typically do so by reading boost pressure, MAF voltage or injector pulse width. Make sure the kit you choose offers controlled injection rather than a simple on/off system. As far as quality goes, look for high grade material use in the kit components and have safety systems that include low tank level monitoring and alarm, and warranty. The ECU will advance timing as it can until it finds the pre-ignition ceiling, the point where timing cannot be advanced any more without increased ping. However the range of adjustment is only so far. So if you're using water/methanol as a safety net, for instance due to a smaller turbo being pushed a bit outside of maximum efficiency, then re-tuning of the ignition map is not likely necessary. 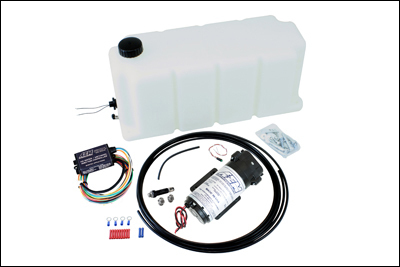 However if you are looking to gain the maximum power advantage with a water/methanol kit, then retuning is recommended. Ask your tuner what ratio is best for your climate but for most 1:1 mixing is the most likely recommendation. * Piston engined petrol military aircraft utilized water injection technology prior to World War II in order to increase takeoff power. This was used so that heavily-laden fighters could take off from shorter runways, climb faster, and quickly reach high altitudes to intercept enemy bomber formations. Some fighter aircraft also used water injection to allow higher boost in short bursts during dogfights. From Wikipedia's Water Injection page. Water Injection calculator for use with RSR nozzles, which as far as I can tell is a fairly obscure manufacturer of low-run, expensive non-street motorsports parts. Whew. Same thing with italics and bolds, they're all mine. hello I know this is a little late for the thread, however i have the ARD green tune in my 1996 volvo 850 turbo and was wondering if that tune is compatible with the kit found here http://www.vivaperformance.com/water-me ... ction-kit/ ..also how hard is installation more specifically what does it entail? The tuning would need to be changed to take full advantage of the potential power water/meth can provide so a re-tune would be in order but you could certainly use that product. As for install it's somewhat up to you, more basic/less showy installs can be done in a few hours while stealth or high visibility (think pretty) install can take quite a bit more time. End of the day I'd say it's not a first timer install so might be helpful to have someone that's been there around to give guidance as needed! OK cool what kind of "retune" would i need, as in, changes from what i have now and price. Also what kind of power gains can be expected? Retuning is typically around the timing map for the most part and will generally take no more than 2 hours. Pm me for direct pricing !